The Library's acquisition of rare books and manuscripts, usually by gift, goes back to the beginning of the University and its library. The first major manuscript collection, the Lewis Henry Morgan Papers, was received in 1909, in the Morgan bequest. However, the separate departmental collection began with the opening of the Rush Rhees Library in 1930, with its Treasure Room and vault. In the 1930s, a Local History Room was also created, later renamed Local History and Archives. These divisions merged in 1955 to form the Department of Special Collections, rechristened Rare Books, Manuscripts and Archives in 1969, and Rare Books and Special Collections in 1983. Upon completion of the 1970 addition to Rush Rhees Library, the Department moved to the second floor of the East Wing. No library of any size or stature could exist without the generous support of the collectors and donors who, in many cases, almost define the institution. Ours is no exception. For each collection described, we have attempted to identify and credit the donor or donors who made it possible; we extend our deepest thanks for their contribution to a fine university library. The many other donors not named also merit our sincere gratitude. The Jacob Robert Cominsky Reading Room offers researchers a bright and comfortable space to work, complete with two computers and wifi access. The room is named to honor Mr. Cominsky, a member of the University of Rochester Class of 1920 and publisher of the Saturday Review from 1942 to 1967. 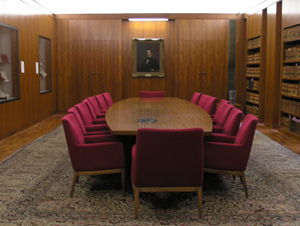 The William Henry Seward Room provides a space for archival instruction sessions, which bring manuscript materials into the University's curriculum. Enhancing this space are four exhibit cases, which further promote the department's collections. This room commemorates the gift of the William Henry Seward Papers by the Seward Family. The Hyam Plutzik Library of Contemporary Writing offers a second classroom space within the department, where students can study the works of great literary figures. The Plutzik library is home to the William and Hannelore Heyen Collection of modern poetry. The Jarold Ramsey Study and the Hilfiker Gallery of exhibition space are attendant features of this space. 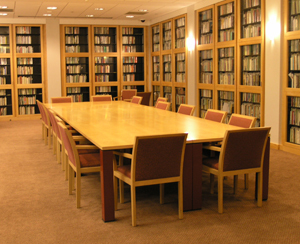 The Sibley Music Library in the Eastman School of Music and the Edward G. Miner Library in the University Medical School also feature fine rare book and special collection facilities. Interested parties should contact these libraries directly for information regarding their collections.